No one is going to see your car’s undercarriage, so you might not care whether it sparkles and shines like the rest of your vehicle. However, a good undercarriage cleaning is still an important part of the car washing process. In fact, some experts would argue that paying attention to those dirty under-bits is actuallymoreimportant than that extra coat of wax. Here’s why. Unless you spend a lot of time doing hands-on work on your vehicle, it’s very easy to neglect the parts you can’t see. This is especially true for the undercarriage, since it requires quite a bit of wriggling to get a good glimpse of what’s going on down there. However, the underside of your car is the part that comes most into contact with dirt, grime, salt, chemicals, tar, and general road debris. Think about it – every time your car hits the road, it leaves small particles behind. In addition to the dirt picked up along roadways, it leaves behind brake dust, leaking fluids, rubber from the tires… Multiply this times the tens of thousands of cars driving through your city every day, and you can see where the problem comes in. All of this debris is kicked up and deposited into the undercarriage of your vehicle. And because you probably aren’t crawling around and taking a peek at these messes, you often won’t see them even when the buildup becomes problematic. One of the best reasons to regularly wash this road gunk away is to keep your car running smoothly. Caked-on road debris can create quite a few problems when it comes to your car’s temperature, since it acts as a kind of insulation that can cause overheating in your engine and transmission. This gunk can also enter parts of your engine through imperfect seals, causing buildup in areas where it can be very difficult (and costly) to remove. Anywhere air gets out is a place road debris can get in, especially if you have a lot of build-up. Rust can also become a problem when you don’t regularly clean your undercarriage. Road salt—especially in places like Utah, where the winters can be tough—works into the metal bits of your undercarriage, making its way into cracks and causing a corrosive layer to form. Over time, this could result in excessive wear and tear, and even the breakdown of your vehicle. Regular undercarriage washes can also contribute to your car’s longevity. 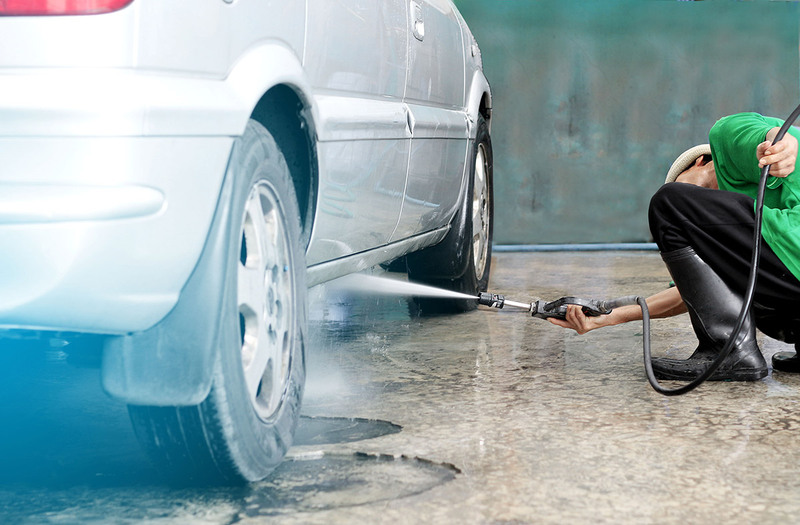 Just as you get the oiled changed every six months and regularly change things like your windshield wipers and filters, it’s important to create a long-term maintenance schedule that includes a deep wash.
Fortunately, modern car washes make it very easy to include undercarriage washing into your routine. Our Salt Lake City automatic car washes include this undercarriage feature. Because it’s almost impossible to crawl under your car and wash the undercarriage for yourself, it’s strongly recommended that you get a professional wash and undercarriage treatment at least once a month (more if you’re driving in the winter, since corrosion is so much worse during this time).